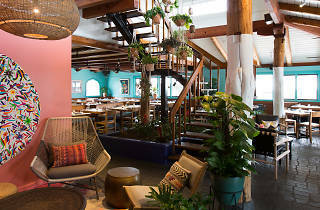 Find beachy Tulum-inspired designs, sustainable ingredients, and housemade tortillas at this modern Mexican venture from the Rustic Canyon fam. Share ceviche and a sheet pan of nachos with cotija and fontina. 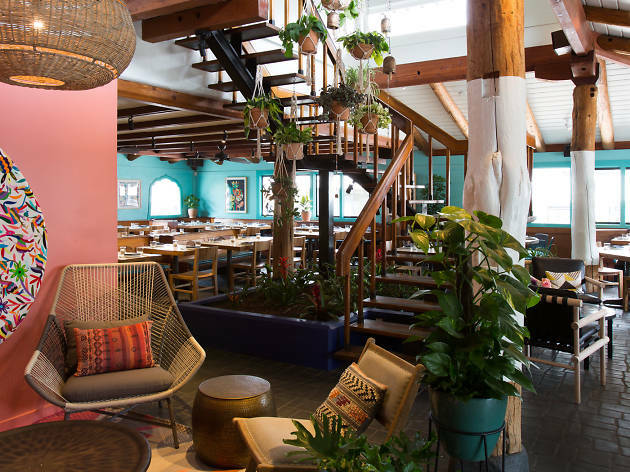 Comforting lamb birria, duck chilaquiles, and chicken with mole are excellent options, as are fish tacos. Sip market fresh margs, or consider Avocado-lada with rum and Falernum or The Uplifter with reposado and cinnamon syrup. Fantastic atmosphere with great food that's a California take on Mexican, so not completely authentic. The duck confit chilaquiles are phenomenal, the yellowtail ceviche is unexpected but delicious, and the hostess recommended the steak and nachos for next time. Good for dates, girls' nights, and special occasion meals.